A view of part of the 67ac holding for sale near Claremorris. There is always a steady trade in smaller land portions in Mayo, with plenty of customers for good ground. 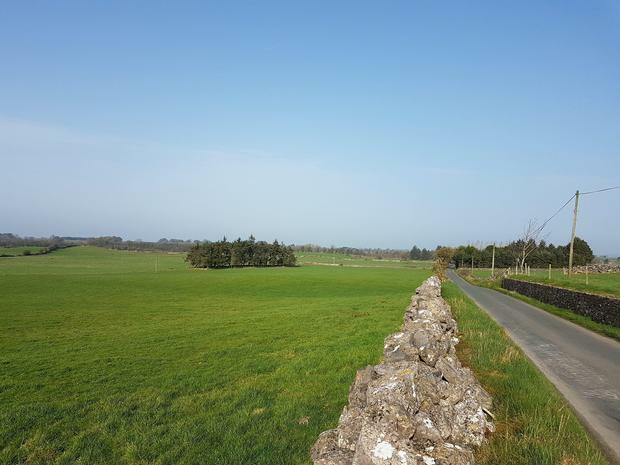 A solid 67ac grass farm with substantial road frontage, a yard and an internal roadway at Maltpool, Claremorris is expected to attract lively attention. Auctioneer Gerard Hanley of Sherry FitzGerald Hanley is guiding the private treaty sale at €500,000 or almost €7,500/ac. Located 7km west of Claremorris, 7km from Ballyglass and 6km from Mayo Abbey the farm is located in a strong farming area and would make an ideal addition to any current enterprise. It comes with 27 entitlements. The farm buildings include a two-column double slatted shed, two large concrete silage pads, a 30-cow cubicle house and a converted milking parlour suitable for commercial letting. There is also a three-column hip-roof shed used to house calving pens. According to Mr Hanley the land is well laid out, well fenced and serviced by a constant water supply. A good road network makes it easy to check and move stock and makes the place suitable for dairying. Given its road frontage the property has good residential potential. Meanwhile, adjacent to the 67ac, a five-bedroom, 1950s bungalow on 1ac is for sale separately and guided at €130,000. This could be included with the sale of the 67ac. The property is divided by the public road into two sections of near equal size and can be bought as an entire or in a series of lots. The first lot is made up of the full 67ac along with the farm buildings and yard and guided at €500,000. The second lot is made up of 36ac of land with road frontage guided at €270,000. The next lot is a 32ac parcel also with road frontage along with the farm buildings and this too is guided at €270,000. Mr Hanley reports strong interest in the land with keen interest being shown in the entire including the bungalow. Meanwhile at Drum near the famous Knock Shrine, the same auctioneer is handling the sale of 40ac of mixed land in a variety of segments with good road frontage. One of the lots includes farm buildings while a bungalow residence and a traditional farmhouse associated with the farm are for sale separately. The 40ac of land is guided at €155,000.